Jinja Honchō has a formal system for people who support it financially. If you give a certain amount of money or more, you get a number of benefits in return. One is that you are sent Jinja Shinpō free of charge (the minimum donation amount is much higher than the subscription rate), another is that you get a little card that is supposed to entitle you to special sanpai at the “beppyō jinja” (although my experience suggests that at least some of the staff and priests at such jinja have never heard of this), and you are invited to a special matsuri once per year, held at different places across the country. Yesterday, I attended this year’s matsuri. It was held at Oyama Jinja, in Kanazawa, a city on the Japan Sea coast. It is much easier to get to from here than it used to be, as a direct shinkansen line started operating three years ago; it is now under three hours by train from Tokyo. Oyama Jinja is an interesting jinja. It was founded in 1873, and enshrines Maeda Toshiië, an important samurai and the founder of the largest non-Shogunal domain of early modern Japan, centred on Kanazawa. He had been venerated by his descendants during the Edo period, and after the Meiji Restoration some former samurai of the domain founded the jinja, which was then recognised by the state. This makes it an important jinja that enshrines a historical figure with only loose links to the Imperial family, a rather uncommon situation. It also has a very unusual gate, built in 1875, which combines Japanese, Chinese, and Western architectural styles, and is notable for the stained glass in the cupola, something found in almost no other jinja. The matsuri itself followed the standard pattern, and included kagura (sacred dance) performed by the miko. The kagura was not, however, standard. It was called the “Sword Dance”, and it was performed by two miko, one of whom carried a spear, and one of whom carried a short sword and its scabbard. The sword started in the scabbard, but was drawn early in the dance, and looked, from where I was sitting, like a real sword. The kagura was accompanied by a flute (played by a priest) and drum (played by another miko), and had a section that was fairly fast, unlike most of the standard miko kagura. I gather that this struck the other attendees, most of whom are priests, as unusual as well. There are a number of standard patterns of sacred dance, but there are also traditions specific to particular jinja, and new kagura are still being created today. 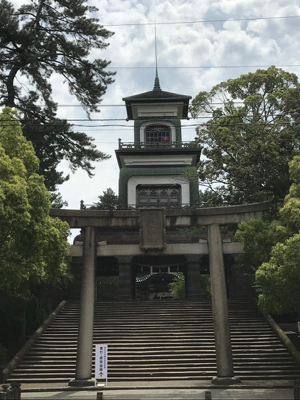 In the afternoon there was a half-day tour, on a tour bus, to a couple of non-standard Kanazawa attractions, one of which sold soy sauce ice cream, followed by a formal visit to Ōno Minato Jinja, a jinja that is even older than the city of Kanazawa. The most striking feature of this jinja was an ema in the former prayer hall. The ema is twelve metres long, and tells the entire story of the war between the Taira and Minamoto at the end of the twelfth century. I mentioned in my Patreon essay on things found in a jinja that ema used to be larger and more elaborate, but that’s the biggest one I’ve ever seen.